For many, an interest in politics, who our leaders are, and which political side we’ll choose to stand on is sparked by single events. For me, as a pre-teen adolescent, it was the Iran hostage situation. I could not fathom how one of the world’s two superpowers was allowing a little 3rd world country to hold our people hostage. It was troubling, and I detested Jimmy Carter for not sorting it out. To be fair to Carter; being so young, I was blissfully ignorant of the behind the scenes actions that were being attempted—all I saw was the big picture. The long lines at gas pumps, thanks to Carter’s poor handling of OPEC, were hurting adults trying to make a living as well, but as a kid, I simply didn’t understand economic issues yet, so it didn’t really affect me like the Iran hostage situation. As we all know, Ronald Reagan took office, and our hostages came home. From then on, I was a Reaganite. One of the things that upset me this past election was the notion that the economy was still so horrible because of what Obama inherited. While we all mostly agree he did inherit a poor economy, four years later, is it really an acceptable excuse? As Reagan took office, he inherited a misery index of 20.76. It was the highest recorded misery index in history going back to that statistic’s inception in 1948—it hasn’t been to a higher level since either. Carter may have been a nice man and a brilliant scientist, but as a president, he failed miserably at maintaining America’s economic strength, much less growing it. By comparison, Barack Obama inherited a misery index of 9.65. Less than half of Carter’s benchmark. While I agree G.W. Bush’s handling of the economy at the end was poor, it was a far cry from the disaster Carter presided over. After four years under Reagan, the misery index improved from the aforementioned 20.76 to 11.81—a significant improvement. After four years of Obama, it went from 9.65 to a slightly worse 10.15. Reagan wins this battle; one point for the Gipper. But let’s delve further. If we look at GDP numbers, at the end of the Carter administration, dividing our total GDP by our population, we have approximately $11,433 per person in 1979. After 1983, that number improved to $15,171; an improvement of 25%. Now let’s look at Obama. In 2008, the average GDP per capita was $47,363. At the end of 2012, that number grew to $49,494; an improvement of 4.3%. Reagan wins again; two points for the Gipper. All that being said, one of the fairest tests of a president in a democratically-elected contest is how he is judged by the people he governs during a reelection. 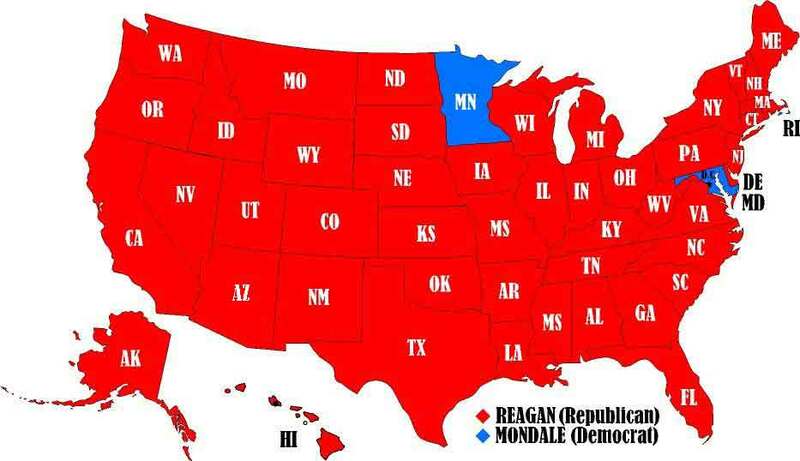 After four years of Reagan, he resoundingly beat Walter Mondale 49 to 1 states—Minnesota the lone stand out. He won 525 electoral votes compared to 13 for Mondale, and a popular vote of 58.8% vs 40.6% (54,455,472 to 37,577,352 votes). This means that a Republican actually won the left-wing bastions of California and New York! It was the greatest election defeat in history. Barack Obama against Mitt Romney on the other hand was 26 to 24 states; 332 to 206 electoral votes; 51.1% to 47.2% with 65,910,437 votes to 60,932,795. We’ll call that an easy Reagan victory as well—three to nil; the Gipper. It was a long time ago, but when questioned about the state of the economy, I don’t remember Reagan blaming Carter his complete first term; he was too busy making his case for the future. He lowered the top-tier tax rate from 70% to 28%, gave people their money back, and just as planned, the economy took off like a rocket. So well in fact, that we reduced the world’s superpower population by half as Russia crumbled while attempting to compete. It was capitalism versus communism; capitalism won. Now, I can’t say that I will agree with all the things that the present group who call themselves Libertarians in the sense of a party say, because I think that like in any political movement there are shades, and there are libertarians who are almost over at the point of wanting no government at all or anarchy. I believe there are legitimate government functions. There is a legitimate need in an orderly society for some government to maintain freedom or we will have tyranny by individuals. The strongest man on the block will run the neighborhood. We have government to ensure that we don’t each one of us have to carry a club to defend ourselves. But again, I stand on my statement that I think that libertarianism and conservatism are traveling the same path. One of the constant knocks against Reagan by libertarians and liberals was his massive spending on defense—a criticism he fairly leveled at himself. But people seem to lose sight of the fact that for all of Reagan’s spending on defense, every succeeding president has put more troops in harm’s way than Reagan did. Contrary to belief, he avoided conflicts as well as any president could. What he did do however, was ensure that America was deemed to be so powerful, that any nation endeavoring to threaten us would understand it would be assured destruction. And with the exception of Russia, it wouldn’t be mutual. He referred to it as peace through strength. When America was founded, there were many superpowers—we weren’t yet even one of them. But by the end of 1988, in no small part thanks to Reagan, we were the only one left standing, and remain as the only one still today. If you lead by example, others will follow. America was a leader 200+ years ago in adopting a principle of liberty, and as a result of our success, there are free nations all over the world who followed our lead; including the monarchies we rebelled against so many years ago. Sadly, they may never give us credit for inspiring them, but true greatness doesn’t need acknowledgement, it’s content in the knowledge it is great. Previous PostInternet Trolls Thrive On Attention—But Please Don’t Feed The AnimalsNext PostBusiness People In Office: A Good Thing?